modeFRONTIER employs true multi-objective optimization. modeFRONTIER explores the design space in search for the Pareto Frontier, where each objective can no longer be improved without compromising others. This is opposed to the single-objective approach where an objective function is used to take into account all objectives by using weighting factors (determined a priori). The disadvantages of using an objective function are that it is difficult to determine an appropriate weighting factor; objective functions can sometimes be meaningless; and that compromises are not properly explored. A simplex is a polyhedron containing N + 1 points in an N dimensional space. Therefore, a simplex in two dimensions is a triangle, in three dimensions is a tetrahedron, and so forth. The SIMPLEX is a single-objective optimization algorithm. At each iteration, the vertex on the simplex with the worst configuration is moved in search for a better configuration. A genetic algorithm is a search method that mimics the process of natural evolution. A starting population's configurations are encoded into a collection of string known as chromosomes. These chromosomes undergo inheritance, mutation, selection and crossover much like natural evolution. After sufficient iterations or generations, 'survival of the fittest' rule would remove the weaker designs and the better solution would remain. Each objective is seen as a player and assigned several variables. During each iteration or step, each player will attempt to optimize its own objective by application of single-objective algorithm (such as SIMPLEX) on its variables. modeFRONTIER also offers multi-objective robust design optimization (MORDO) and Multi-Criteria Decision Making (MCDM) tools. 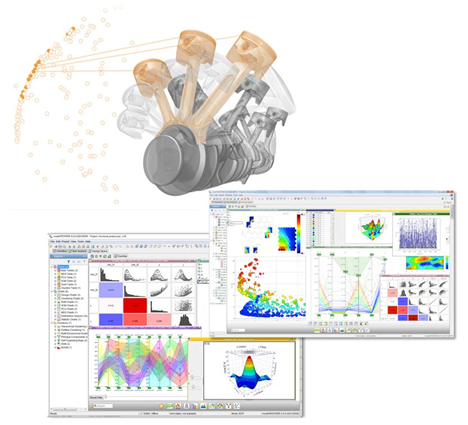 For computationally intensive processes, modeFRONTIER supports response surface methodology (RSM), which interpolates virtual design outputs based on a limited set of results. Among many choices of algorithms, each having its own set of parameters, making a choice may be difficult for a new user. However, modeFRONTIER is equipped with an optimization wizard that proposes the most appropriate DOE and algorithm based on the number of inputs, objectives and time available to run tasks.